IF THIS GUY hadn’t been running to cross the Euston Road, we’d have had a very clear shot of an Evening Standard booth with a flat panel TFT-LCD panel displaying all the paper’s headlines. We investigated further because we speculated what the heck was going on. The news seller has to change the battery once or twice a day to replenish the LCD display. The continuous LCD display is beamed by wi-fi, not WiMAX, from a place across the road. The system has been installed for about two months. The vendor could not say whether or not the new system sells more papers. 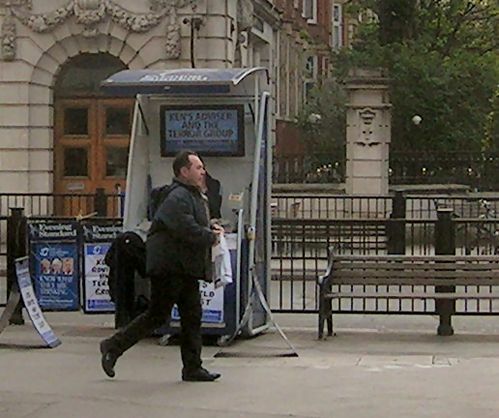 There are now three free newspapers in London, one of which is owned by the same firm that sells the Evening Standard. People, he said, did not crowd around to see what the headlines are. Just across the road, there were lots of people giving away free newspapers, one of which is from the same stable as the Standard. This entry was posted in Uncategorized and tagged LCD, London Evening Standard. Bookmark the permalink.